This is a special post co-authored by Jacy Young and Jennifer Bazar and published simultaneously at both the Advances in the History of Psychology (AHP) and FieldNotes blogs. This June, following a successful Cheiron meeting in Dallas, Texas two of AHP’s bloggers (Jacy Young and Jennifer Bazar, the latter also of FieldNotes) along with Kelli Vaughn-Johnson traveled to Robbers Cave State Park in Southeast Oklahoma. Our goal was to track down the Boy Scouts camp used as the site of the now infamous 1954 Robbers Cave experiment and see what remains nearly 60 years later. 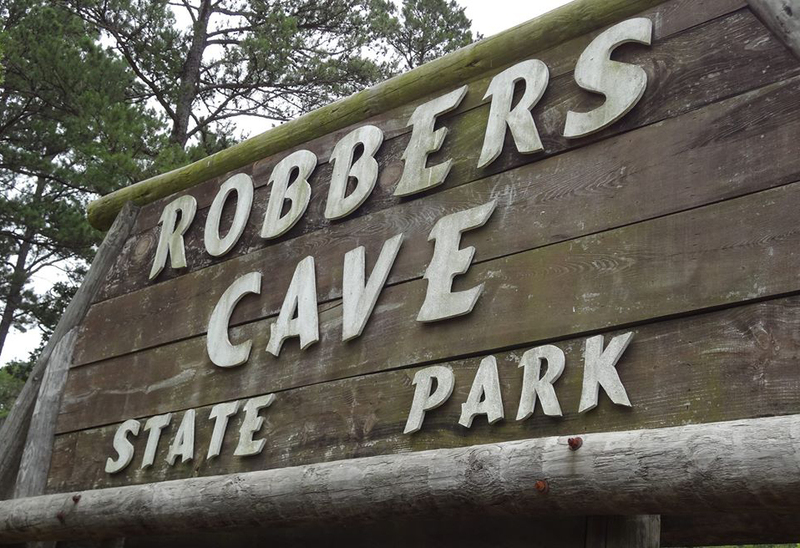 In the summer of 1954 psychologist Muzafer Sherif, along with a group of research assistants posing as camp personnel, brought a group of twenty-two eleven and twelve year old boys to Camp Tom Hale in Robbers Cave State Park. The goal of this study, like the two conducted before it in Connecticut and New York State, was to induce and observe intergroup conflict and cooperation. To do so, Sherif and his colleagues instituted a three stage plan. In stage one, the boys were split into two groups (eventually known as the Eagles and the Rattlers) and encouraged to form strong in-groups. Stage two involved initiating competition between the groups through a tournament that saw the the Eagles and Rattlers compete in activities such as baseball and tug-o-war (not to mention various acts of sabotage by the researchers). Once the groups were sufficiently hostile toward each other (coming to refer to those in the other group as “stinkers,” “braggers,” and “sissies,”) the third and final stage was initiated. The aim of this stage was to reduce conflict between the groups. This was done by introducing superordinate goals, which could only be achieved if both groups worked together. These goals included restoring the water supply to the camp and moving the broken down camp truck. Although conducted on a relatively small scale, Sherif intended the study to have far reaching consequences. It is was his hope that in experimentally inducing both intergroup conflict and cooperation a better understanding of the roots of prejudice and discrimination would be achieved and, more importantly, that insight into ameliorating both would result. Conducted in the post-war era, the Robbers Cave study was an attempt to put psychology to work in the service of world peace. You can read the full account of the study in Intergroup Conflict and Cooperation: The Robbers Cave Experiment by Muzafer Sherif, O. J. Harvey, B. Jack White, William R. Hood, and Carolyn W. Sherif. On the day we visited Robbers Cave the temperature was – as our luck would have it – just shy of a thousand degrees. 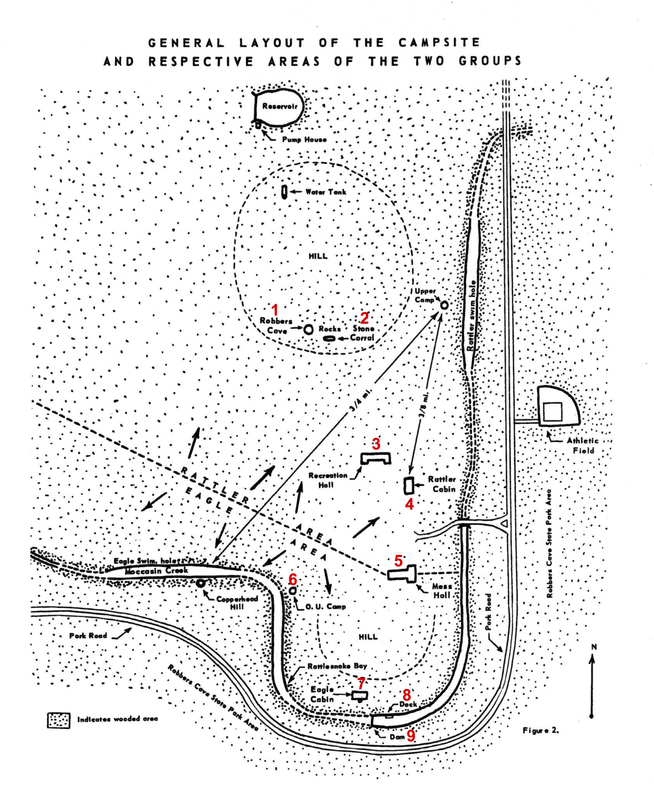 Despite the heat, we perserved in our goal of tracking down what remained of the 1954 camp, using Sherif’s map of the experiment site (below, numbers in red our addition) as our guide. To be fair, this undertaking it not completely original. In 2012 Gene Perry and Gina Perry (no relation), traveled to Robbers Cave for much the same purpose (you can read an account of that trip here). Unfortunately, according to our reconstruction of the site, the one cabin featured in their story was not in fact used as part of Sherif’s Robbers Cave study. After hiking up and around Robbers Cave itself (1), and visiting the Stone Corral (2), we made our way past a parking lot and through a field to explore a series of buildings. Although the campsite was occupied, the family renting it out was nice enough to allow us to poke around a bit as we tried to reconstruct the layout of 1954 campsite. Below, numbered to correspond with Sherif’s map, are the buildings and locations we were able to identify. Where possible we’ve paired photographs from the original study with images of the camp today. By far our favourite pairing is the Rattler cabin past and present (4), where the stone facade from 1954 clearly matches that of the cabin as it stands today (although the windows appear to have been changed over the years). Altogether we were able to track down nine locations, including both the Eagle (7) and Rattler cabins, as well as the dock (8) and dam (9). Not wanting to travel too far off the beaten path, and more than a little warm by this point, we skipped venturing past Robbers Cave in search of the Water Tank, Pump House, and Reservoir. During our hunt we saw no sign of the Upper Camp or Athletic Field, but were admittedly overheated and slightly cranky by the end so did not put as much effort into this search as we might have otherwise. The lure of an air conditioned car was strong. On the plus side, we have a great excuse for planning a return trip one day – just preferably at a cooler time of year. Scroll through below to see all our photographs of the Robbers Cave site. All photographs from the 1954 experiment are taken from Intergroup Conflict and Cooperation: The Robbers Cave Experiment.